Our goal was to gather enough food and cash to provide 400,000 meals. ABC11 was at several Heart of Carolina Food Drive drop off locations Wednesday for a "drive-thru day" and one more push to make sure everyone has enough to eat this holiday season. 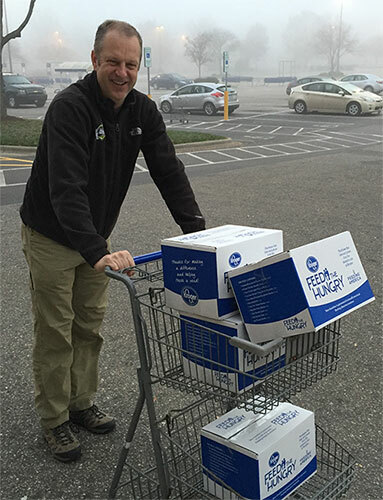 ABC11, along with the Food Bank of Central and Eastern North Carolina, Second Harvest Food Bank of Southeast North Carolina, Kroger, BASF and US Foods, are helping to drive out hunger in our area. We were live all day in Raleigh, Cary, Durham, Fayetteville and Wake Forest. Our goal was to gather enough food and cash to provide 400,000 meals. We're very happy to report that we smashed that goal and collected the equivalent of 500,000 meals. Kroger says the collection bins will stay out through the end of December, so it's not too late to donate. For the full list of collection sites, click here. Heart of Carolina Food Drive drive thru 7:30 p.m.
Heart of Carolina Food Drive drive thru 7 p.m.
Heart of Carolina Food Drive drive thru in Raleigh and Fayetteville at 5:30 p.m.
Heart of Carolina Food Drive in Raleigh at 4:30 p.m.
Heart of Carolina Food Drive drive thru in Fayetteville at 4:30 p.m.
Heart of Carolina Food Drive in Durham at 4 p.m.
Heart of Carolina Food Drive in Cary at 4 p.m.
Heart of Carolina Food Drive drive thru at 3:30 p.m.
Heart of Carolina Food Drive drive thru at 3 p.m.
Heart of Carolina Food Drive drive thru day at 2:30 p.m.
Heart of Carolina Food Drive drive thru day at 2:00 p.m.
Heart of Carolina Food Drive drive thru day at 12:30 p.m.
Heart of Carolina Food Drive drive thru day 8:25 a.m. in Cary and Durham. Heart of Carolina Food Drive drive-thru day at 5 a.m. in Durham and Cary. Heart of Carolina Food Drive drive thru 8 p.m.